How to set up timetracking and use QuickBooks timesheets is a question that I see nearly every day on the Intuit Community forums. There are several ways in which you can enable timetracking in QuickBooks. If your QuickBooks company file wasn’t set up using the EasyStep Interview, turning on timetracking and timesheets is an easy task, but you’ll find that it is slightly more hidden. Turning on timesheets will require that you be logged into QuickBooks in single user mode as the Administrator. From the Edit menu -> choose Preferences. Scroll down to Time & Expenses -> click on the Company Preferences tab. Select Yes to the “Do you track time?” question and set the First day of your workweek. Click Ok to save your changes. Click on the Payroll & Employees preference -> and click the Company Preferences tab. Look for the Employee Defaults button and click on it. Here you will want to click in the little box next to the “Use time data to create paychecks” option. Click OK twice. This turns on the timesheet/timetracking function and makes sure that any new employees that you hire will automatically be set up to use timesheets. 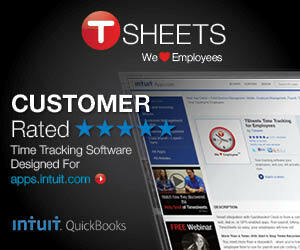 If you already have employees in your QuickBooks file, you’ll need to manually enable timetracking for each employee. You’ll need to edit each employees record in the Employee Center, click on the Payroll & Compensation dropdown tab and check the “Use time data to create paychecks” option. You can now enter employee time using a weekly timesheet or a single activity window by going to the Employees menu -> and choosing Enter Time or by clicking on the Enter Time icon on the Home Page. Any hours that you enter into the Weekly Timesheet will automatically be brought over into paychecks when you create them. The key to job costing when using timesheets is that when you create an employee timesheet that you select a Customer:Job, a Service Item, a Payroll Item, and enter the hours they worked each day on each task and job.